A Canadian writer and educator named Marshall McLuhan came up with the phrase, "the global village" to describe our world. What is a village? "A small community where everyone knows each other" springs to mind. Perhaps the thought that each person in the community helps the village to survive and so everyone is dependent on each other applies. These are good descriptions of a village but could we say this about our world? Physically our world is enormous. How can we all be connected to each other? In the last century, better transportation and communication have allowed people to be in contact with other parts of the world more quickly and more easily than ever before. The world is also connected through global resource use and a world economy. What is grown or made in Asia often is consumed in North America. The products of Europe are found in Australian stores. African produce is found in the kitchens of Europe. The global village, as McLuhan meant it, is an image that shows us to be connected to, and dependent on, other parts of the world. In the last century, huge technological advances made travel much easier, enabling people to travel farther and more often than ever before. The development of railways was an enormous leap forward from animal-drawn transportation. Once the Canadian Pacific Railway was built in the 1880's, people as well as produce could travel across Canada, From coast to coast. It also vastly increased the flow of trade from Briti h Columbia to Britain, enabling BC to share the profits of Anglo-Canadian trade. Furthermore, the CPR became a link in the transportation of goods from East Asia to Great Britain, as fast trans-Pacific ships brought goods to Vancouver, where they were loaded into freight cars to be taken to Atlantic freighters and then on to Britain. This contributed greatly to the early growth of our city, until the completion of the Panama Canal allowed freighters to pass directly from one ocean to the other. Elsewhere in the world, a new generation of fast trains has proven efficient in moving people and goods quickly and efficiently. Japan's Shinkansen , or bullet trains, have proven their worth for decades. European high speed express trains sometimes allow people to move more rapidly across the continent by train, from downtown to downtown, than even plane travel allows. A good example of this is the Eurostar train, linking London and Paris via the Chunnel - a tunnel between England and France. What was once a journey of 8-10 hours by car or train and ferry or hovercraft, or commutes to and from downtown to airports plus a short flight that added up to 3 or more hours in total is now a train journey of roughly the same time as flying and taxing from downtown to downtown - but without the aggravation of horrific traffic jams and airport hassles. Unfortunately such trains have yet to be introduced to Canada, because our widespread population makes them uneconomical at this time. In North America the automobile is the preferred means of travel over short and medium distances. When, in the 1920's, Henry Ford decided to make cars an item most people could afford, it led to a growth in highways and, consequently, mass tourism. Over the years, roadways have improved and so has technology related to this. The primitive dirt tracks that challenged earlier motorists have been replaced by paved, multi-lane, expressways and wooden trestles have given way to impressive steel and concrete bridges. The Confederation Bridge connecting Prince Edward Island to Nova Scotia is an example of how technology has changed people's mindset toward travel. Going to P.E.I. used to be thought of as an all-day excursion because of the hour ferry ride each way, but it now takes only 25 minutes, one way, on the bridge, making a half-day visit a possibility. After a century of development , air travel is now the preferred means of long distance travel. It currently takes eight or nine hours to fly from England to Vancouver, whereas one hundred years ago it would have taken several weeks to complete the same journey by boat and train. The speed of the Concorde supersonic airliner lets it to travel from London to New York in under three hours -actually allowing it to land at an earlier time in the day than it departed, because of the time difference between the two locations. On December 31, 1999 to January 1, 2000 a specially chartered Concorde circled the globe allowing its passengers to celebrate the millennium change several times as they flew westward, repeating midnight several times before returning home for much needed rest. While most of us have not experienced the thrill of supersonic air travel, an increasingly large percentage of the population flies from time to time and more and more of us use planes to visit distant places that our ancestors could only dream of seeing. On the seas a new industry has developed in addition to continuing freighter traffic, leading to more people experiencing more of the world. The cruise industry allows passengers to experience seven different countries in one week. This was never possible before and has brought our world closer together. A negative consequence of this and increased air travel is that Western culture has come to dominate other parts of the world. This will be discussed later. During the twentieth century, scientists initiated space travel Many nations poured money into space programs and the world became connected through our attempts to find out what lies beyond our planet. Initially countries were in competition, though now nations are co-operating with each other, helping to spread the huge costs around. Space experiments, further travel and maintenance of space stations are all areas where nations are working together. Although these connections are between governments and big businesses, the public will soon be directly connected to space. The Rotary Rocket Company is building a rocket that will become the first civilian spacecraft to put tourists into space . This is not only making our world smaller, but it is making areas beyond our world smaller. The invention of television brought the world closer together because it broadcast news from around the world into our homes, and introduced programs from other countries as well as our own. Local differences in populations disappeared as we copied the ways of talking and acting that we saw on television. Of course the process actually began decades before as movies influenced generations of cinema audiences. Television took this further, reaching a far wider audience, maintaining many more hours of contact with its viewers. Over time this became increasingly internationalized as satellites enabled huge amounts of information to travel instantly around the globe. When we turn on our televisions, we see news beamed directly from anywhere from Afghanistan to Zimbabwe. Kids around the world can, and do, watch the same television shows and listen to the same music. Fashionable students in Japan and Australia may have similar tastes. There are still differences, of course, but few would deny that the world is being homogenized. Satellites not only allow us to receive radio and television stations from around the world, they also help us make international telephone calls. People spend an enormous amount of time in front of the television and by the time you graduate from high school you will have spent around 12,000 hours in school and as many as 15,000 hours in front of the TV. This might be changing, however, because of the Internet. The Internet can be a source of knowledge or entertainment. We can look up weather reports from around the world, research a topic, play video games , check the stock market , listen to a radio station from Brazil , send an email to a cousin in Holland, perhaps even having our words machine translated for us, or watch a TV program being aired in Florida. Currently in North America, there are 2,000 radio stations, which are live on the Internet. While television is a passive medium, the Internet allows us to interact with material on screen. The newest advance in this field is development of broadband connections for the home through cable access or the ADSL phone lines (which allow regular phone connections to take place while the internet is in use). While businesses with local area networks have used big bandwidth connections, like T1 lines for some time, this has not been economical for home users. Now cable and ADSL connections allow anyone almost instant loading of web pages. This speed allows us to load sites that are memory intensive, using large graphic files, sounds and even moving images - things that would take a long time to load on conventional dial-up modems. Multimedia options vastly improve the Internet experiences of users and appear to be setting the direction of web page design for the future. Cable or ADSL connections are also always "on" and do not require preliminary login procedures. Although the Internet provides us with links to around the world, is it going global? It is estimated that by 2005 there will be one billion people logged onto the web, which is one-sixth of the world's population. However, developed countries use the Internet far more than developing nations and this is one more example of the growing gap between rich and poor countries. The United States and Canada are the top two countries in the world in terms of numbers of users. As Margorie Olster reported in the Vancouver Sun, "90 per cent of Internet host computers are in high-income countries with 16 per cent of the world's population. New York has more Internet hosts than all of Africa." While Internet use is exploding around the world, its use is far from global. Cell phone technology is another technological advance that is impacting people all over the world and bringing them closer together. Cell phones enable people to be anywhere in the country and speak to friends and family while carrying their personal phone along with them. A person can be accessed whether at home or on the other side of the continent. The caller need not even be aware of the receiver's location. As with the Internet there are disparities between the rich and poor. Even among wealthier nations, some cultures have far more cellular phones in use than others. In Japan 88% of people in their twenties have a cell phone while in Canada the figure is much lower at 20%. Part of the reasons cell phones are so popular in Japan is that they do not pay per call and many are now buying palm held ones with internet access included. Not only can you phone people from anywhere in the country, you can also have Internet access anywhere. While this mobility extends nationally, it is not yet international in scope. To enable this, the International Telecommunication Union has been established as a committee by the United Nations which is to find agreement on a single wireless standard. Currently, North America has a different system from Europe, which is different from Asia. If we achieve a common wireless server, a person could use their cell phone anywhere in the world! 1. Was Marshall McLuhan right in describing the world as a global village? Why or why not? 2. What transportation developments have "shrunk" the world, making distant places now seem near? 3. How have improvements in communications technology brought the world closer together? 4. Discuss changes in transportation and communication technology with your grandparents and or parents. What has changed in their lifetime? What changes do you see happening by the time you reach their age? 5. 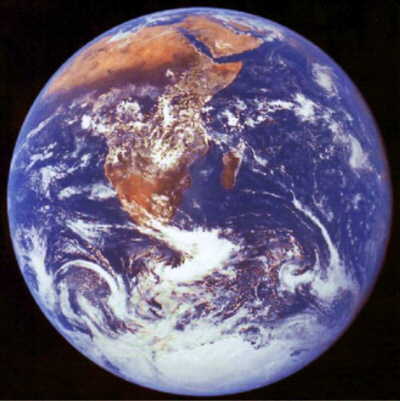 Have all people in the world experienced the same sense of the planet shrinking as we have? Explain. The world is made up of many systems, which function independently and interact with each other. A system can be defined as a set of connected things or parts, therefore, the entire world is one big system. An example of a simple system is an aquarium. In it, there are plants, water, gravel, fish and fish food. If one thing affects this mini-system, such as temperature change, the entire system will be impacted. For example, if the water is too warm, more algae will grow. Algae use oxygen, which will affect the fish because their oxygen supply will diminish. Three very important systems that are present in the world are the physical, biological and economic systems. The earth has many systems, but all are connected. The physical world is made up of non-living elements such as water, wind, soil, and air. Each of these interacts with each other to form a system. Within this system, wind and ocean currents circulate the globe in specific patterns and soils need a certain amount of water to stay nutrient-rich. Smaller systems exist within the larger one. An example of a physical system is the water cycle . The sun's heat causes evaporation of water into the atmosphere. The wind carries the water particles over land where it gathers more moisture until it eventually rains. The rain travels back out to the ocean through rivers or groundwater. If any part in a physical system is affected, the entire system will be impacted. How Have Humans altered physical systems? Soils are formed over long periods of time by the physical weathering of rock and the buildup of humus (material from decaying plants, animals and insects). Soil flourishes when it contains the right amount of water. If climate change alters the amount of precipitation, this can have disastrous consequences. If more rain falls than can evaporate, the rain pushes down into the ground and nutrients are stripped From the soil. This is called leaching. If the opposite occurs and more water evaporates than falls, the water makes its way up to the top of the surface and as it evaporates, it leaves behind some salts. Both of these processes damage soil, making it more difficult for farmers to grow healthy food, leading to soil erosion. This degradation may be caused by natural processes, or by changes caused by man's actions - directly, in the alteration of landscapes by construction activity, or through larger climatic or through indirect global changes brought about by the sum total of man's activities. Man's production of acid rain has had a direct impact on the water cycle. 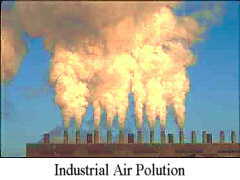 Large volumes of gas and dust have been put into the atmosphere from factory smoke, car exhaust and the burning of fossil fuels. These gases, which are primarily sulphur dioxide and nitrogen oxide, attach onto water droplets and fall back on the earth when it rains. This rain is more acidic than rain without these particles and so have a toxic effect on our world. Plant and animal life start to die because they can no longer live in water that is that acidic or they eat contaminated food, which makes them sick. Forests begin to die because their resistance to diseases and insects is decreased. Crops can't absorb as many nutrients from the soil and so they don't produce as much. Buildings start to corrode and more people suffer from respiratory problems. Many lakes in Ontario suffer from the effects of acid rain and there are many lakes, which cannot sustain life anymore. All of these negative consequences occur simply because one factor affected other parts of the water cycle. Wind and ocean currents travel around the world in patterns and because of this, pollution of air or water spreads far beyond the boundaries of the place where it was created. Air pollution has been responsible for the death of many lakes in Ontario. The operators of the Inco smelter in the mining town of Sudbury , knew that the pollution they created was bad for the environment and their solution was to build a very tall smokestack. They thought the pollution would be carried away from the city and they were right. Killarney Lake, which is three hours away by car, is now completely dead as a consequence of this action. In recent years, much has been done to eliminate the high levels of emissions that created a "moonscape" around Sudbury, but great damage was already done. Polluted water has long been a problem associated with human concentrations. Even before the industrial revolution the Thames River in London, England, for example, was a health hazard. Industrial processes tended to worsen the situation as industrial effluent was added to biological wastes. Toxic substances, like heavy metals, find their way into rivers, lakes and oceans, posing a threat to human and other life forms alike. Lake Ontario is so full of chemical wastes that it is said that photographic film can be developed in the lake water. In Britannia Beach, toxic substances continue to leak out of the mine tunnels and into Howe Sound decades after the mine was closed. In the Atlantic Ocean and the Baltic and North Seas, poison gas shells from World War I were dumped after the end of that conflict and their contents will eventually be liberated once the shell casings rust away. In the Arctic Ocean sunken Russian nuclear submarines, complete with their nuclear reactors, sit and rust on the ocean floor. One day their radioactive cores will come into contact with waters that are crucial to northern fisheries. The Oscar II vessel Kursk, which sank in August, 2000, is not the first to go down and experts believe it will not be the last. Arguably the worst case of environmental pollution was the result of a nuclear explosion in the Ukraine. On April 25, 1986 a nuclear reactor at the Chernobyl nuclear plant exploded in the worst nuclear accident that the world has yet experienced. The explosion and fire that followed it injected large amounts of radioactive material into the atmosphere, which was then carried far and wide by wind currents. The Soviet Union did not tell anybody, but the world found out about it two days later when radiation monitors in Sweden picked up very high levels of background radiation in their country. The radiation spread far more than anyone believed and although the USSR was affected the most from this tragedy, the effects were felt all over. Sheep farmers in Scotland had to have their sheep tested for radioactive poisoning for up to a decade after the incident. A number of deaths followed the accident, but thousands more are expected over time as radioactive exposure triggers cancers and other health problems. Many feel that the inability of the USSR to deal effectively with the Chernobyl disaster was a significant factor in the ultimate break-up of that country. The biological world differs from the physical world in that this system includes plant and animal life. Examples of the biological world are biomes such as tundra, forests, deserts and grasslands. Each of these systems contains plant and animal life which are dependent on one another. One example of a biological system is the carbon cycle . There is a certain amount on carbon dioxide in the atmosphere that comes from volcanoes, the ocean, rocks and the burning of coal, oil and natural gas. This carbon is used by plant life in the photosynthesis process. The trees take in Carbon dioxide and water and through photosynthesis they produce oxygen and sugars. This enables animals -- including humans -- to breathe and get energy. Animals breathe out carbon dioxide and, combined with the other sources of carbon, this cycle remains in balance. The tropical rainforests are the most productive and diverse of all ecosystems. They also have more species than all the other ecosystems combined. The biggest tropical rainforest is found in the Amazon , Brazil. A tropical rainforest, as its name suggests, has a very warm and wet climate. These forests are also known for their very tall trees. Looking from an airplane you will see a mass of green treetops, known as the canopy. This is the richest part of the rainforest. Very little sunlight gets through the canopy and so most of the species live in this part of the forest. At the midlevel of the forest, there are smaller trees, which also contain birds, insects and mammals. On the forest floor, there are small shrubs and, once again, different life. As trees decay, the leaves are broken down and feed the insects. Birds and animals prey on the insects and larger animals prey on them. In this way, the rainforest is a self-contained biological world. In a temperate forest, the soil may be nutrient rich and so if the trees are cut down the soil can still be used for cultivation. In the tropical rain forest, because most of the nutrients are found in the canopy, the soil is very nutrient poor. If the rainforest is cut down, the soil will be very poor for other types of land use. Deserts occur naturally all over the world and make up more than 12% of the earth's surface. They are found in hot and cold climates where there is very little precipitation. At the most they might receive 20 cm per year, but often will go for several years without any rain or snow. Many life forms exist in the desert with special features that allow them to survive this type of climate. For example, the cactus plant has spines instead of leaves, which means it requires minimal amounts of water and the water can be contained in the body of the plant. 1. How is the planet Earth a system? 2. Describe a smaller system that is contained within it. 3. How is soil degraded? 4. What is acid rain? How is it created and what impact has this man-made problem had on the water cycle? 5. What happened at Chernobyl? How did a local problem become an international disaster? 6. What are biomes? 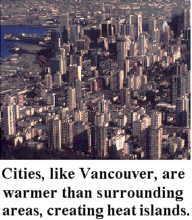 What natural biome exists around North Vancouver? 7. What is the carbon cycle? How is man affecting it? 8. How do soils in temperate and tropical rainforests differ? Why is this a concern for forestry practices? 9. How much of the earth's surface is desert? How Have Humans Impacted the Biological World? Biological diversity is the name given to describe different species and ecosystems. The number and kinds of species and ecosystems are continuously changing. New species arise as others die off. Unfortunately, humans are changing the diversity of our planet by speeding up the process of extinction for many life forms. When a government or agribusiness decides that a cash crop will be grown, loggers clear the land for the plantation. This land was home to many different species of plants and animals, all or which interacted with each other. A cash crop, such as corn, is only one plant variety and generally only one type of corn is planted - a monoculture. This means the gene pool is dramatically decreased. The same land that was once home to many different species, can now only sustain limited types. One major problem is that by taking away the homes of many life forms, we are encouraging their decrease and possible extinction. If disease or insect infestation attacks the monoculture, virtually all plant life in the plantation is affected. In a natural forest, if one species falls ill then the other trees and life forms still survive. However, in many planted forests, such diversity is eliminated in the same way that it occurs in farmers' fields. In order to deal with the threat of disease to monoculture crops, scientists are attempting to modify plant varieties to make them more disease and insect resistant through genetic modification . This will be dealt with in more depth in the resources chapter. 1. How has the development of agriculture affected biological diversity? 2. What are cash crops and why do you think that they are usually planted as monocultures? 3. What is the gene pool and why is it decreasing? 4. Why are scientists working on genetic modification of plant life? It is difficult to deal with the physical and biological world separately because they work together. It is also hard to analyze the physical and biological world without humans because we impact the world we live in. All of the systems are linked to humans and our economy. We all need food, clothing and shelter and, to obtain these things, we need to exchange something for them. People who are making or providing goods are called producers and those using or receiving them are called consumers. The economic world deals with the global relationship between these two groups. Often, production and consumption occur in different parts of the world, so the world economy links them into a single system. This causes the physical, biological and economic systems of the world to be linked together. The grapes we buy at Safeway or Save-On-Foods in April are shipped from Chile, in the Southern Hemisphere. The fact that we consume this fruit in Spring, months after our own grape harvest, is encouraging the expansion of grape planting on the other side of the planet. Similarly, the wheat that now blankets much of the Canadian Prairie, and has replaced the natural grasses that grew there for millennia, is grown primarily for consumption around the globe and not for Canadian use. Globalization, the tendency for trade to extend internationally rather than remain localized, goes well beyond the agricultural examples provided above. Alcan, a producer of aluminum, sells its products around the world. Interestingly, it manufactures its product in the remote northern part of British Columbia, at Terrace, well away from its consumers. Ordinarily, one might expect that this location must be determined by the location of its raw materials, but in this case one would be mistaken. Aluminum is produced from a mineral rich soil found in the Caribbean. This is mined and shipped all of the way to Terrace, where it is smelted into the final product. In this case it is the energy requirement that determines the manufacturing location. Cheap BC hydroelectricity makes this industry viable despite its distance from both raw materials and consumers. The production of aluminum therefore affects ecosystems in northern BC and the Caribbean in order to meet the needs of consumers around the globe. Clearly, we live in a global economy and the choices of consumers in one part of the world will impact on physical and biological systems around the planet. 1. What is globalization? Is it likely to increase? Why or why not? 2. Examine the labels on your personal belongings - clothes, appliances, electrical goods, or any other products. List the countries where these items came from, then locate them on a world map or globe. How are your findings evidence of globalization? How is the Global Economy Impacting Global Systems? Deforestation is related to economics, whether it is occurring because of corporate decisions such as the expansion of mining or ranching activity in the Amazon or whether it is the result of an individual's decision to burn off a small patch of forested land to farm in a remote village in Asia. The Amazon rain forest is being cut down at an extraordinary rate. About 17,000 square miles (approximately the size of Switzerland) of forest was cut down in 1998 and it is estimated that 16% of the forest has been cut down to date. The trees are being cut primarily to provide products for consumers in the developed world. Although the Brazilian government knows the devastating effects deforestation has on the environment, it also recognizes that the country needs the money that this business brings in. During the 1960's banks in developed countries made loans to Brazil and now, in order to make repayments, Brazil has to exploit its resources. Population increases mean that there are more people to be fed. In poor countries families find that they need more land to sustain themselves and so they clear land to plant food. The burning of tropical forests provides nutrients for poor soils in the short run, but farmers find that they must move along and repeat the process fairly frequently. As they strip land of nutrients they clear new land. Compounding this problem is that many of these countries have taken the best land for cash crops and so the land that poor people get is already not as nutrient-rich and won't last as long. Furthermore, consumers in the rich world desire tropical hardwoods for flooring and furniture, increasing the economic pressure to log in tropical regions. For a number of reasons, tropical forests are under siege and it does not look like this pressure will decrease. 1. Many species are becoming extinct as their habitat is being destroyed. It is estimated that between 50 and 150 species are lost every single day. Deforestation around the world is contributing to the greatest mass extinction since the disappearance of the dinosaurs. 2. Once the trees are cut down, the nutrients in the soil quickly vanish and this leads to desertification. 3. 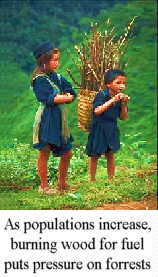 Burning trees for fuel, as many people in the developing world do, adds large amounts of carbon dioxide to the atmosphere, which contributes to global warming. 4. In removing broadleaf forests, one of the key actors in the fixing of carbons into trees through photosynthesis is eliminated. Once again, carbon dioxide levels in the atmosphere are increased and global warming is a result. Tropical deforestation, therefore, has consequences that extend far from the tropics and is caused by more than just local conditions. We contribute to it and we are also subjected to its effects. The carbon cycle exists naturally in a state of balance. Unfortunately, many countries are putting much higher amounts of carbon dioxide into the atmosphere From the burning of fossil fuels and the burning of forests. There is more carbon dioxide in the atmosphere than can be converted into oxygen and sugars by plant life. This carbon dioxide helps retain the sun's heat by allowing solar radiation to pass through the earth's atmosphere, while trapping the infrared radiation that is reflected from the earth's surface from escaping back into space. Most scientists believe that this has led to an overall warming of the earth in a process known as the greenhouse effect. Global Warming is the result. Greenpeace , an environmental group, feels that to avoid serious environmental consequences, the overall temperature of the earth should not increase by more than one degree Celsius. In order to do this, we can still release 112-237 billion tonnes of carbon in the next hundred years. However, if we burn only 75% of all the oil, coal and gas that we have already found to date, we will hit our limit. This means we have found more fossil fuels than we can safely burn. Hansen, who once argued that this was a development of vital importance, now feels that he was wrong and that other factors have offset most of the warming effect. Other scientists believe that natural fluctuation of world temperatures accounts for most of any increase that might be taking place. The United States government has been particularly critical of proponents of the greenhouse effect and has been reluctant to undertake measures to reduce greenhouse gas emissions. However, their position is not supported by most of the scientific community. Presently, governments and oil companies are spending millions of dollars in attempts to find even more sources of fossil fuels. All of this money is being poured into an industry that Greenpeace feels we won't be able to use. If we continue to burn fossil fuels at our current rate, we will hit the limit in 40 years. Canada is, possibly, guilty of contributing to global warming as it produces four times the amount of gases per capita than other nations. The process by which deserts spread into nearby land is called desertification. Deserts are surrounded by arid and semi-arid land. Arid means dry but this type of land still receives more rainfall than a desert (20-25 cm per year). Semi-arid land receives 25-60 cm of rainfall per year. Both arid and semi-arid areas are covered with grassland and or scrub (small trees and bushes). 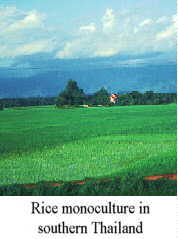 This type of land can be cultivated for food. If the land surrounding the desert is overused, it will erode into desert. Left on alone, there is a cycle of increased and decreased plant growth and it is unlikely that the desert will spread. Unfortunately, humans have changed this cycle, and now there is often a one-way pattern, which involves the spreading of deserts. One-third of the land on the earth's surface is arid or semi-arid. Of that land, more than half of it is in danger of desertification . 1. Population pressure leads to farming land not being left fallow often enough. As these fallow periods get shorter and shorter, the soil is unable to sustain as much life. 2. The best land in a country is usually used for cash crops, which means that people in poorer countries have land which does not have enough nutrients to sustain them for very long, yet they must continue to farm it regardless. 3. Irrigated land is often not drained properly which leads to salt build-up in the soil. This strips the soil of nutrients. 4. Herds of animals used for ranching are being confined to smaller spaces. They strip the land of nutrients because they overfeed and trample the ground with their hooves. 5. 90% of the people in the developing world need wood as their source of fuel and so they contribute to deforestation. IV. Consumption: How You and I Affect Deforestation and Desertification. We are contributing to deforestation and desertification by being consumers. Let's look at Nike sportswear as one example of how our consuming habits can impact the environment. Although the consumers of Nike products are from the developed world, the products consumed are produced in poorer countries, like Indonesia. Nike t-shirts are made from cotton grown on a plantation as a cash crop. The land that was cleared in order to plant the cotton would have contained much biological diversity. The clearing of the land destroyed many animal and plant habitats. The cash crop can only support a limited number of species, which means we are limiting the gene pool. The land, which is used for the cash crop, might be the best agricultural land in that country, which prevents it from being used to grow food, forcing subsistence farmers onto marginal land that is soon depleted of nutrients. Both deforestation and desertification is occurring just so we can have a t-shirt with a swoosh on it. Of course the same could be said of any cotton shirt and to blame Nike is simplistic. The fact is that we in the rich countries are well-dressed and we would like to stay that way, but doing so impacts others, elsewhere on the planet. McDonalds is one of the largest corporations in the world with 24 000 stores in 118 countries. As McDonalds - and other burger chains -- gain worldwide appeal, the demand for beef rises. In order to have more beef, land must be available for cattle. As with the cotton plantation, many species are lost as forests are cut to increase grazing land for cattle. Since cattle needs large amounts of land to graze, in poorer countries rising population leads to over-concentration of cattle. They overfeed on the land, soon stripping the soil of its nutrients. Because the land cannot regenerate, the rancher needs new land and so he clears new areas for his cattle. The land that was abandoned has been stripped and is well on it's way to becoming a desert. Hamburgers may be agents of deforestation and desertification! Once again, the example is McDonalds, but the same could be said of numerous other chains. Ultimately it is we, the consumers, who are the cause of the problem. 1. What are the causes of deforestation in tropical regions? Do the same causes apply to the loss of forested land in British Columbia? Why or why not? 2. What is global warming? What do scientists believe is causing it? Why do other scientists believe that it is not something we need to take action on? 3. 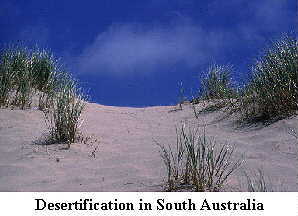 What is desertification and how has man contributed to this process? 4. How could you be contributing to environmental damage in other parts of the world? Technology is linking the world more and more closely. Through technology we have been able to learn about each other and profit from our increased contact. However, with this also comes the recognition that humans are having an enormous negative impact on the physical and biological worlds. As our numbers grow and our impacts on the world's systems are magnified, we must come to a greater understanding of the problems that we are causing and deal effectively with them. We cannot go back to a simpler time, when man's impact was negligible. We must go forward to a future in which we make conscious decisions to minimize the damaging effect that man seems to have on the planet. 1. How has man's technological inventiveness changed the planet? What have been the positive and negative results for mankind? For the natural world? 2. How do your actions affect people in other parts of the world? How do the actions of others, elsewhere, affect you? Before beginning the Geography unit, consider what we already know about how humans interact and are connected. Marshall McLuhan created the term "global village" to describe what he believed was a "shrinking world." He believed that actions taken in one part of the world affect other parts. Insert your ideas into the web provided below. A) Give broad or general examples of how humans are interconnected throughout the world. B) Provide specific examples to illustrate the general topics. Using the information above, write a paragraph explaining how the effects you listed have been caused by improvements in transportation and communication. Acid rain is one example of how human activity has affected the physical world. Your task is to complete the following diagram demonstrating the series of events that occur because of acid rain. Add drawings to illustrate each step. 1. What are the causes of acid rain? 2. In your opinion, what is the biggest problem that acid rain causes? 3. What steps would you suggest to solve this problem? Avery, Dennis. "Feeding the World With Biotech Crops," The World and I. Pp. 154-161, May 1998. Caring for the Earth; A Strategy for Sustainable Living. IUCN, UNEP, & WWF, Aland, (October) 1999. Chidley, Joe. "How the Internet Killed Television: It's Stealing Young Viewers, it Doesn't Care About Borders, and for its Next Act, the Web is Going to do Something TV Won't. Let You Watch Whatever You Want," Canadian Business. Volume 71 No. 26, pp. 111-130, November,1999. Condon, Judith. Chernobyl and Other Nuclear Accidents. Rainstree Steck-Vaughn, Austin, 1999. Dunlop, Stewart. Towards Tomorrow; Canada in a Changing World; Geography. Harcourt Brace Jovanovich, Toronto, 1987. Dunlop, Stewart and Michael Jackson. Understanding Our Environment. Oxford University Press, Toronto, 1991. McLeish, Ewan. The Spread of Deserts. Wayland, England, 1989. Menezes, Joaquim. "Wireless Technology Not So Hot In Canada: Once Ranked fourth in Mobility Usage, Canada Now Sits at Number 14," Technology in Government. Volume 7 No. 2, pp. 25, February, 2000. "One Billion Worldwide Expected to Be Using Internet by 2005, Says Study," Canadian Press Newswire March 21, 2000. Schiesel. Seth. "Still a Long Way From Home: Lack of a Common Standard Remains the Wireless Industry's Biggest Problem," Financial Post (National Post). Volume 2 No. 88, pp. D11, February 5, 2000.